Daily: I will move. Every day. Meaning something actually active. Preferably outside. Daily: I will eat sensibly. With two birthdays, Thanksgiving and Christmas, I'm not swearing off desserts or special foods. But I am going to get back to eating the way I have in the past when I have successfully lost weight -- predominantly healthy, with planned "treats"including a day here or there that is PLANNED to be a bit more indulgent than normal. I know I lose weight better when I have planned splurges. Oh, and I WILL check in every Friday/Saturday. I drastically increased my water consumption. And I pretty much didn't drink Mountain Dew. The couple that I had were 1) because of a migraine, and 2) one night coming home when I was really, really desperately in need of caffeine in order to get home. Decluttering -- I did a pretty decent job of this too. Maybe not quite every day I was home, but most. I did eat sensibly. I didn't go crazy. No dessert on Thanksgiving even. Working out... I blew this. Checking in... you know, the easiest thing on the list? Blew this one too. End result though is that I feel a lot better, my clothes are a lot looser, I'm no longer addicted to Mountain Dew, so it was a very good challenge. I kind of missed doing this yesterday. With dentist appointments and other errands, it was just a busy, busy day. So, today, I want to talk about why IEW (Institute for Excellence in Writing) makes my list of favorite homeschool companies. I was first truly introduced to IEW when I signed up to attend a mom's "class" using Teaching the Classics. IEW doesn't produce this product, but they do sell it. I left that six week "class" convinced that yes, even I could tackle literature analysis. I also left feeling warm fuzzy thoughts about IEW in general. Teaching the Classics (I later purchased the DVDs so I could watch them with my kids) is about teaching the teacher how to teach. Literature, in this case. Adam Andrews is funny, obviously knowledgeable, and he makes me feel like I can do this. I left my class with a notebook, which was adequate for implementing the ideas I had learned. But I did find that I really wanted access to seeing it again, which is why I picked up the DVDs three years later. On my wishlist is the Worldview Supplement for Teaching the Classics, which I'm sure will also be excellent. A few months after that class -- in fact, the day before Trina was born -- I made my first "real" purchase of IEW materials. I purchased Linguistic Development Through Poetry Memorization. Lengthy title. Fabulous program. I debated it, as it seemed so expensive. But reading through the intro material on my hospital bed (!) and then watching the DVD at home... well, I was convinced that this was worth every penny. And it has been. So let's address cost here. On the one hand, IEW makes and sells expensive stuff. The Poetry Memorization program is $65. But it is totally non-consumable, and it is meant to be used over a few years. There are four levels in this program, which could correspond to four years of work. 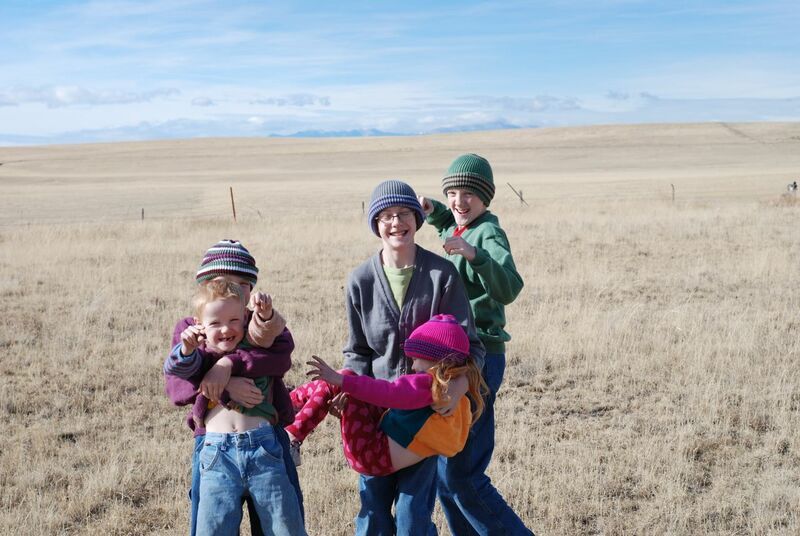 So... for $65, I have four years of EASY TO IMPLEMENT poetry memorization work for each of my five kids. That's $3.25 per year. And I could sell it when we're done and get back a big chunk of what I put into it. That doesn't even factor in the "teacher training" provided. The DVD is fantastic. Nurturing Competent Communicators. Isn't that a great title? It goes through a whole lot of great stuff... why read aloud? Why memorize poetry? I'm thrilled to own this. Then there is the ease of use. IEW has chosen 19 poems per level, and they are a great mix of poems I would have chosen (you know, when I find a couple of weeks to do nothing but comb poetry books and create my own program) and poems I never would have picked to memorize. A combination of short ones and long ones. A mix of serious and funny. And all of them are recorded. So poetry memorization is simply a matter of listening to the CD regularly (daily!) Yes. It really is that easy. And what is fun is that even my two year old (who is now six) was memorizing the poems. And he still knows them. All for $13 per student for my five kids. 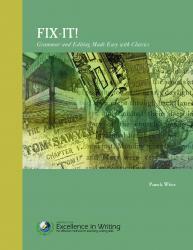 Nurturing Competent Communicators -- have this on mp3 and DVD. He makes a case for reading aloud and memorization, as a means of putting sophisticated language patterns into kids' heads. You can listen to some of these for free, and IEW is currently doing a 12 Days of Christmas promotion where today they are giving away the mp3 of The Four Language Arts. It was only after all of this that I was finally truly introduced to their writing materials. I was able to borrow Teaching Writing: Structure and Style from a friend. I watched it, was totally sold on the IEW methodology, and I purchased a theme writing unit -- Ancient History. I found that more difficult to do than I expected. Partially, because I keep having products to review that distract me. But moreso, I think, because I really needed to watch TWSS again and absorb the information more completely. I'm sure people who "get" writing (not like me!) would do better with these though. Last summer, I found an awesome price on a used Student Writing Intensive set (Level B, for 6-8th graders) and we started working through that. Oh, how incredibly easy! But then review products came up and we dropped the ball. Again. For William and Thomas, who are going to be studying the middle ages in our new school year, I am seriously looking at purchasing the Medieval History theme-based set. Something that ties into their history is going to be easier for me to implement now. Overall, what I love about IEW is that the materials tend to work for a variety of ages, and they focus so much on teaching ME. They reinforce a lot of the things I believe about education -- reading aloud is critically important, and learning to communicate is incredibly valuable, to name two. Their materials hold their value incredibly well, so if you use something and won't need to do it again, you can sell it for a huge percentage of what you paid for it. That says two things to me... first, the fact that the materials are that in demand speaks volumes about their quality. Second, when you can resell it (after using it) for 80% of what you paid, the total investment drops dramatically, making IEW even more affordable. Edited to add: I didn't even get into my kids' reactions to IEW. They absolutely adore Andrew Pudewa. For a long time, he was known as "The Ooey Gooey Guy" (the first poem in level one, which Andrew reads on the CD, starts... "Ooey Gooey was a worm, a mighty worm was he...") though now they think of him as the funny writing dude. When I listen to one of his mp3s, I inevitably will hear someone say, "I hear a familiar voice," and I get a request to turn up the volume. The kids are more than willing to listen to what he says and make their dad watch their favorite parts of the writing DVDs. I never get complaints about "having" to watch an IEW DVD, and I usually don't get complaints about doing the assignments either. 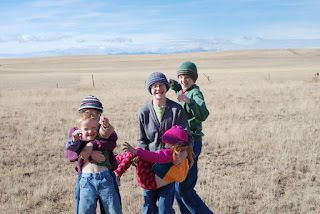 Okay, so I decided to post about a few of my favorite homeschooling companies, just to close out 2010. And probably my absolute favorite homeschool vendor is Sonlight, so I have to start with them. 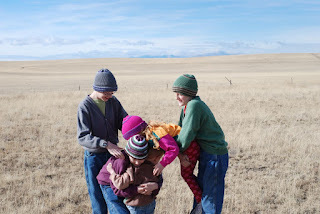 When I first started looking into homeschooling, about a dozen years ago, I had no idea that there was anything out there besides your basic textbooks, and that wasn't something I wanted. 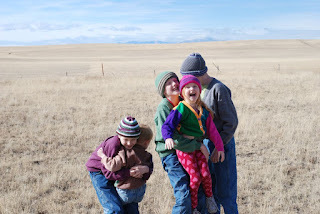 What I wanted to do with my kids (all two of them at that point) was to read. A lot. To learn history by reading biographies and historical fiction. To learn science by reading biographies and lots and lots of great non-fiction titles. To spend time at historical sites. To play with magnifying glasses, batteries and magnets. I assumed that what I'd have to do was to find a good math program, find a grammar book and a spelling workbook, and probably something that gave me ideas for how to teach reading... and otherwise make up everything myself. It isn't US history every year. They teach multiple points of view. When learning about the Revolutionary War, for instance, you hear about the patriots (the only point of view I ever heard), but also the colonists who were loyal to England. You also get some perspective from Canadians, the British government, and ordinary British citizens. You even get the perspective of France. Most of the money spent on the curriculum is for real books. Real books that can be read again, and again, and again. My kids know that there are good books that aren't Sonlight books. But when we read a book that starts slow, they will ask: "Is this a Sonlight book?" Because if it is, they assume that it is going to get better. Once in a great while they are disappointed. Sonlight cares about missionaries, from a variety of faith backgrounds. They care about church history. Prior to Sonlight, I didn't know enough about either one to try to create my own "thing" to teach from. At this point, we have used Sonlight up through Core 6 (first half of world history for older kids) and Connor will be starting Core 7 (pictured below) in another week or so. It no longer works for us to do one core for everyone, and my middle guys have made decisions to do something else for now. I hope that we will be able to continue to make Sonlight work for us for many more years, because I especially appreciate how Sonlight makes me think instead of telling me what to think. Disclaimer: I was not obligated in any way to write this post and received absolutely nothing for doing so. All products mentioned were purchased by my family. Although I can fantasize about reviewing Mathtacular 4 or Core 100, can't I? Some of you may remember reading my check-ins this past summer/fall as the boys and I read (okay, listened) to the Bible over the course of 90 days. This experience was pretty amazing. I've read through the Bible before. My kids have listened to the entire Bible a couple times before. But wow, going through it at this pace really gave the stories new meaning. Well, Amy of Mom's Toolbox is starting up again. January 3 is the big day, and the 90 days goes through April 2. Signup is at this link. I posted a month or so ago that I had signed on to be a mentor (which means you can request me when you sign up! Eeek!) And that I had decided not to read myself this time, but to have my kids reading following the various teen/tween/kid schedules found here. That means I'll be listening to William read 1-2 chapters a day, and Thomas read a chapter a day. And I may read to Richard and Trina. Well, I changed my mind. I'm going to read too. For one thing, I signed up (for free) with YouVersionand they have a reading plan for the 90 Day Bible. I plan to start that on January 3. This way, I can read online, or read on my iTouch... and mark off what I've read as I read it, so I don't have to struggle to keep track (just to keep ON track!) If you sign up at YouVersion, look for me and friend me. I'm brink7 there. I'm getting excited about this. And I know I have some friends doing this too. Jennifer at a glimpse of our life. Dawn at Guiding Light Homeschool. Tristan at Our Busy Homeschool. I know I've seen at least a couple more, but that's all I'm finding right this moment. Anyone care to join me? I'll add your link to the post if I know about it. That will help me cruise over to try to encourage you. Okay, nobody fall over from shock! It is Friday, and I am doing my Fit Mommy Friday check-in. Week 9. Of 10. I cannot believe this is almost over. No real workouts. It is tough with company... But I have been moving. I have been eating sensibly. I have been drinking my water. I did some decluttering. I'm feeling better about a lot of things. I stay comfortable in my jeans all day long instead of wishing I could get some sweats. An Unforgettable Gift by Karen O'Connor On Christmas morning, 1912, in Paducah, Kentucky, fourteen-year-old Charlie Flowers and his three brothers and two sisters huddled in their beds, fully dressed, trying to keep warm as the wind howled outside their small frame house. It was a desperate time for the family. Earlier that year the children's father had died. And their mother had not found work. The coal had run out and there was little money––none for gifts. Their scrawny tree with decorations made from scraps of colored paper had been given to them the night before by a local merchant. "Can't sell this one," the man said with a nod of his head before handing it over to the eager children. To pass the time, the siblings joked and shouted stories from their bedrooms across the hallway from one another. Then suddenly a racket from the alley at the rear of the house broke into their games. "Charlie," his mother called, "would you see what's going on out there?" Charlie pulled on his shoes, grabbed a thick overcoat from the hook by the door, and ran out back. There stood a man in a wagon bent over a load of coal, shoveling it into the shed as fast as he could. "Hey Mister, we didn't order any coal," Charlie shouted. "You're delivering it to the wrong house." "Your name's Flowers, isn't it?" the man asked, still shoveling. "Well then, there's no mistake. I've been asked to deliver this to your family on Christmas morning." He looked the awe-struck boy square in the eye. "And I'm under strict orders not to tell who sent it," he teased. Charlie ran into the house, his coattail flapping in the cold morning wind. He could hardly wait to tell his mother and brothers and sisters. God had provided––just as he had on that first Christmas morning so long ago when He sent his only son to a needy world. Charlie Flowers died in 1994 at age 96. And right up to the last year of his life, not a Christmas went by that he didn't tell the story of that sub-zero Christmas morning of his boyhood when two men gave his family an unforgettable gift. It wasn't the coal that was remembered or cherished, Charlie often said––welcome as it was––but rather what two men brought to his desperate family. One, for his gift of recognizing their great need and taking the time to do something about it. And the other, for being willing to give up part of his own Christmas morning to deliver it. That gift of so long ago has continued to warm the Flowers family from one generation to another, as Charlie's son––my husband, Charles––calls to mind these two unknown men each Christmas morning and whispers a prayer of thanks. About Karen: Karen O'Connor is an award-winning author and writing mentor living in Watsonville, California with her husband, Charles Flowers. Karen’s latest book is 365 Reasons Why Gettin’ Old Ain’t So Bad (Harvest House 2010). For more information, please visit Karen on the web at www.karenoconnor.com. 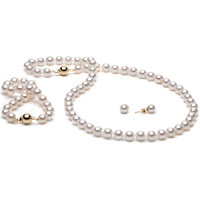 12 Pearls of Christmas: Just Give Me Christmas This Year! All I Want for Christmas… Is to be able to have Christmas this Year by Melissa Mashburn This is a simple request, isn’t it? 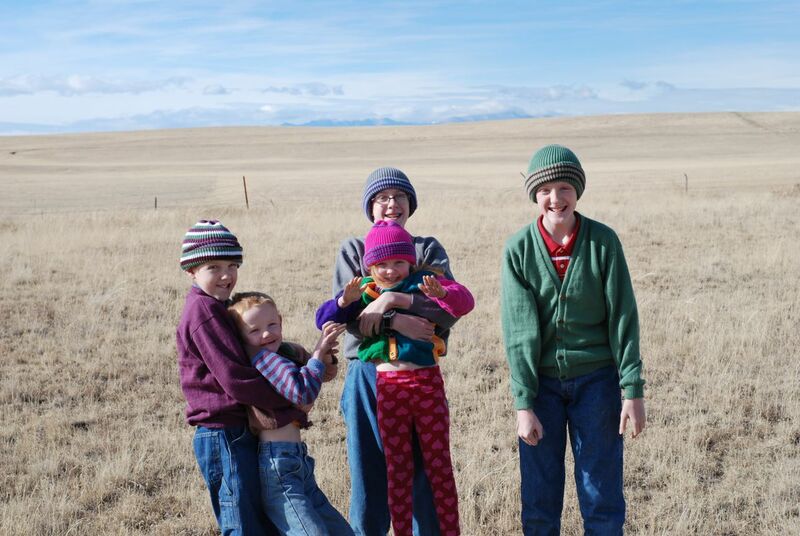 In the previous years, we had great big bountiful Christmases with our family. Gifts, goodies and general Christmas cheer but this year it was different. The year before has been chock full of disappointments, failing businesses and severe cutbacks for our family. Sitting with my husband one night we hammered out the bare minimum that we could spend that year for Christmas and even still the total was four hundred dollars. It does not sound like a whole lot compared to what we’ve spent on Christmas before, but this year it could have been four thousand dollars because we just did not have it. We prayed, I cried, we prayed some more and decided that we would cut back anything else that we could that year so we could have Christmas for our kids. We did not know how we would make this happen, but we knew that we needed to step forward in faith that it would happen. Not even two days later, we hear a knock on our front door. We open the door to see some friends of ours from church. With tears in their eyes, they handed us an envelope and said that the felt they needed to give us this. We opened the envelope and inside there was four hundred dollars cash. Shocked, stunned and with tears flowing down our face we just sat there in a state of crying and laughing at what God had done. We never shared with anyone that year what we needed, how bad it was, what was going on or what that number was for us to have Christmas for the kids, but God knew. He took a willing servant, led them to our front door and changed Christmas for us that year. After many years of being in full time ministry we knew that God would provide, but when He shows up just at the right moment, you know that it was all a part of His plan to show how much He loves, provides and cares for His people. Father God, thank you that after all the years of serving and loving you in ministry that you continue to teach, guide, love, shepherd and care for us. You, Father, are abundantly gracious and kind, thank you for showing up for us at just the right moment every time, forgive us when we forget that. In Jesus name, Amen. Kids all had eye appointments yesterday. Four of the five are great. Connor needs new glasses, including new frames. Can't afford to do that until January. We had a screw-up at the bank. In the process of investigating it, the teller informs me that it involved a payment to Compassion. She overrode the charges because of who the payment was to. (Mix-up is fixed, money is moved, balance is what it should be now.) I'm very grateful it wasn't a gas purchase or something that was the final straw, as that saved us a $25 charge. One of my Boy Scouts got his 2010 merit badge cards signed off. Tracking and Carpentry. Other Boy Scout still needs to do that. The Scout Shop confirmed that they just need to finish it in 2010, they don't have to get the advancement person to register it in December. YAY. Still have some work to do to get this to go through. Thomas earned his Webelos badge this month, thanks to his den leader pushing some stuff through. Den leader went to the Scout Shop to make sure to get the special 100th Anniversary badges for the kids who have earned it. YAY! Went to see Voyage of the Dawn Treader with six boys and a girl. It was a blast. I think this is my favorite Narnia movie now. The Dawn Treader itself was absolutely beautiful. I'm in a position with reviews right now where I am doing a LOT (just check my sidebar, yikes!) but it is amazing how absolutely perfect almost everything on that list is. I'm overwhelmed sometimes by how incredibly fortunate we've been in this whole "review gig." I won a giveaway yesterday for an Bible/Art DVD. I'm so excited. I really hoped to get this. So Dale got the kids bundled up in their new Christmas sweaters and hats, all made by my mom. Though Richard's hat seems to have vanished as it isn't in the pictures anywhere. Gift List by Tricia Goyer I've been thinking lately how hard it must be for Oprah to Christmas shop. I mean if you were on her "gift list" wouldn't you expect something really, really good? The woman gives away cars and trips to Australia on her television show for goodness sake! It seems by the end of Christmas Day her friends and family would look at the pile of presents and think, "Is that it?" I mean if you knew there was billions of dollars she could spend on you, would you ever feel satisfied? Sometimes I think we approach God the same way. We look around at our home, our family, our job, our free time and we still aren't satisfied. We wish our body looked better, our clothes were more in style, our husband was more considerate and our kids were more ... well, like the perfect little people we picture in our mind. Our careers don't excel as quickly as we think they should and people don't give us the attention we feel we deserve. We're tired and anxious and the to-do list seems to be tacked to our hearts for all the pain it causes. Often, we look around and don't speak the words out loud, but think them just the same. "Is that it?" I mean, You're the God of the universe and You have all things in Your hands and under Your control. Couldn't you provide a little more money to help those bills disappear or make me a bit more content with the man I've chosen to spend my life with? And I thought Oprah had it tough. Is there ever a time when God doesn't hear the murmurs? Again, not with our mouths but in our heart. I've been guilty of this--of not being satisfied with the gifts I've been given. Yes, there will always be more to want, but today--at this moment--I'm satisfied. And I look to Him with a grateful heart and whisper, "Thank you, it is enough. More than enough." My excuse? My generous, wonderful boys gave me whatever stupid bug they had picked up. So Thursday and Friday, I mostly slept. Yesterday, I mostly sat with my own box of Puffs. And today, I had to run to town to get a tire fixed, and get some groceries. Like $.99 gallons of milk. Anyway, in spite of feeling like death warmed over, I did fairly okay on my goals over the past couple of weeks. I've been drinking lots of water. I did have two Mountain Dews though. The first one was totally legit. I had a splitting headache and nothing was touching it, which generally means a migraine. I had to take kids into town, so we stopped at the post office partway in (which is in a grocery store) and I mailed packages... and bought a Dew. It did the trick and the headache went away. The other one was today. I probably did too much, being out and about without really eating much, and it was getting late and I was just feeling blah, and I definitely needed caffeine. I chose a CAN of Mountain Dew. A CAN. I would normally have purchased at least a 16 oz bottle, so a can is progress. Anyway, I found it to be sickeningly sweet. Didn't notice that on Tuesday, which is probably good. So today, well, I wonder if I am even going to want it now. It did make me feel better about driving though. Enough of a caffeine/sugar rush to get me home. I did work out twice. Well, sort of. The first time, I only got about halfway through and started feeling really lightheaded. The second time, I really took it easy. I've been walking a lot more. Especially when we head in town. I've been parking in the furthest reaches of the parking lot (when that is safe!) and briskly walking in and out of the store. I've been walking outside at home. And.... my jeans are falling off me. I even wore a smaller size one day this week. They were way too tight... but with a sweater, I think they were okay. They fit well in the legs and rear, it was the waist that didn't work. 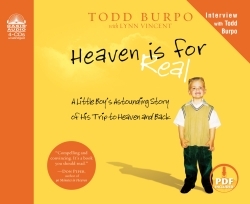 I recently had the opportunity to review the audiobook Heaven is for Real written by Todd Burpo and read by Dean Gallagher. Approximately 4 1/2 hours long, it was a pretty quick listen. Gallagher does an amazing job as reader, and I would completely forget that I wasn't listening to Colton's dad's voice, just to his words. Part of that is the writing style, too. Burpo writes like a dad, just talking to you about what happened in his family. I had read some reviews of the book, so I was intrigued, but skeptical. Listening to the book convinced me that this did seem possible. And listening to Colton talk about meeting his sister in heaven made me absolutely bawl. Colton's mom had suffered a miscarriage that Colton did not know about. As I listened to Colton's dad describe the conversation between Colton and his mom when he talks about meeting the "baby who died in your tummy" I was there. I have no idea how she managed to hold it together and not break down sobbing. I don't think I could have done it. Hurting Near Christmas? 10 Tips to Hope Again by Stacie Ruth Stoelting Feel sad this Christmas? Hey, I know the feeling. In fact, many programs have interviewed me to share about it! Last year, I tried particularly hard to share stories and tips on how to cope with grief during the holidays: I wrote a feature for CBN.com, Coping with Grief at Christmas, visited and counseled grieving people, etc. Then irony hit: Near Christmas, two people I loved died within two days (December 15-16, 2009). Are you or a loved one hurting during the holidays? I relate. But let me encourage you: Jesus remains faithful! As real as my pain, He met my needs and comforted me with peace unexplainable. I’m serious. He’s real. Before I continue with tips, let me share this: If you feel suicidal, contact an emergency counseling service like the New Life Call Center at 1-800-NEW-LIFE(639-5433). Realize and internalize it: God still loves you and wants to hear from you. He wants you to know that there is a Way out of your pit of despair. The Way is Jesus. Rather than mere gifts, make a Christmas prayer list of other hurting people. Then pray for them and request prayer for yourself, too. Contact your church. Tap into ministries (including CBN.com) that offer extra prayer support. And feel free to join my prayer e-group at www.PrayingPals.org or on Facebook by clicking here. End the Christmas comparison game. Don't compare your Christmas to your neighbor's. Don't compare your Christmas to past celebrations. Center on the Savior! This year, trade a superficial Christmas for a real one. Deepen your appreciation for the true Christmas: the arrival of Jesus Christ to banish the effects of sin and death! Whatever your loss or pain, open up and let God be your Gain. Maybe your pain comes from another cause: a divorce, a devastating diagnosis, a job loss...the list extends. God offers to be your Counselor, your Father, your Healer, your Provider. Let Him answer your heart’s cry. Love on people. Even if you don’t “feel” like it, prayerfully do something for someone else who is hurting. Remember: Feelings change. God doesn't. Loved ones' deaths never kill His love for you. God's immeasurable, unconditional love still flows to you! When you know Jesus, you know eternal love and security. Nothing separates you from His love! “For I am sure that neither death nor life, nor angels nor rulers, nor things present nor things to come, nor powers, nor height nor depth, nor anything else in all creation, will be able to separate us from the love of God in Christ Jesus our Lord” (Romans 8:38-39, ESV). Realize the reality of the sudden reunion. Holidays exacerbate the feeling of long separation from our loved ones in Heaven. Does it feel like it will take forever for you to see your loved one in Heaven? Be encouraged: Jesus IS coming again and it will be a time you don't expect! So the fact that you feel like it won't happen soon is a good thing! Once reunited, it will feel like no time transpired. All sadness will be entirely removed! When Jesus comes back to earth, it will be a celebration greater than any previous Christmas you've ever experienced! Additional Help: Ready for some practical tips for coping with grief at Christmastime? Here’s one: Rearrange furniture to reduce absence reminders. To read this tip and others found in another of my CBN.com’s articles: “Coping with Grief at Christmas", visit www.CBN.com. Going thru a rough time? Join Stacie Ruth’s prayer group at www.PrayingPals.org. 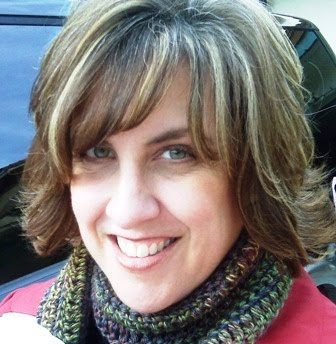 About Stacie: Stacie Ruth knows pain, but she also knows Jesus! After Stacie Ruth met Jesus, her life blossomed with true joy and purpose. Life’s blows hurt her, but Jesus heals and strengthens her. Now an author, actress, and recording artist, she laughs at the irony and praises God, who uses unlikely people...like herself. Discover why she's written a book at age 15, sung/spoken for the 43rd President, been pictured in major media (i.e. The New York Times, USA Today), and keynoted conferences since she was a teenager. To watch video clips, worship Jesus with music from her album, or get in touch with her ministry for women, visit www.brightlightministries.com. I seem to be on a kick, looking for that perfect daily devotional or something. 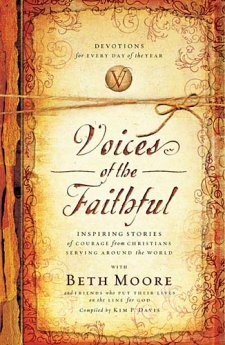 So I welcomed the chance to check out Voices of the Faithful with Beth Moore. Moore wrote the introductions for each month, and the introduction to the book... but the daily devotions were written by missionaries from around the world. I love this book. Each month is organized into a theme. December is Christmas Around the World, and Beth's introduction makes you think about what it would be like to celebrate Christmas in some of the places these missionaries serve, with nobody around who sees Christmas as special. The individual devotions are touching and real. I truly look forward to reading this each day. Having used Sonlight curriculum, with its emphasis on missionaries, for most of the last decade, some of the things mentioned in Beth's comments (or in other reviews) don't really apply to me. My family definitely knows that missionaries are real people and an incredibly varied lot. And we've had plenty of opportunities to discuss and pray for them and the communities they serve. I can see where this would be a fabulous introduction to the whole idea of missions, though. And for me, it is a daily uplifting reminder of the work that is being done worldwide. My plan for the book was to read a chunk, write this review, and then shelve it until January 1. However, I'm continuing to read. And next December, I expect to be looking for Voices of the Faithful, Book 2. I could request to review it, but I think I'll leave that for someone else right now. I'm also seriously considering reading it aloud next time we do Sonlight Core 5.